I'm getting more and more excited to meet you. And wondering when we'll get even half of the things done that we're supposed to before you come. Actually, I think you could show up today (full formed/gestated and healthy!!) and we'd be fine. Our next midwife appointment is in a week. I'll probably do the update after that. Size of baby: One website claims you're the size of a carrot, another a pomegranate. I prefer the pomegranate. From head to toe, you're 10.5 inches long (HOLY CRAP REALLY?! It seems like yesterday they were measuring you in less than inches! ), and 12.7oz. Kid...you're getting sorta big. Gender: Girl, girl, girl, girl...did I mention you're a baby GIRRLLLLL. And if you come out and you're a boy, I'm still dressing you in a lot of pink/purple stuff because that's what people are giving me! Movement: You really like kicking to the right of my belly button, and sometimes my bladder. Sometimes you do a one two punch, which is amusing and odd. You REALLY kick hard when a kitty lays across my belly. I can't decide if you love or hate the eat. How I'm Changing: Belly is getting bigger, back/hips ache more, baby is moving more, I'm sick of hormones making me cry. 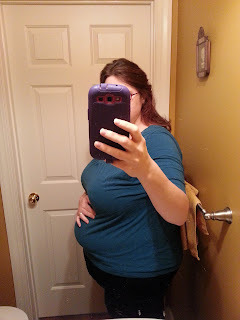 Maternity Clothes: Some, but mostly yoga pants, and sweats. How I'm Feeling: moody, needy, tired. Sleep: my lower back is starting to be rather sore, and sometimes when I roll over on my side, it sorta feels like the baby wants to fall out, but once I'm asleep...I'm out. What I miss: Energy, consistent exercise, losing weight, airplane seatbelts fitting comfortably. Cravings: Not really. I would love some cider right now, but our grocery store didn't have any. Best Moment this week: Probably getting kicked by you! I'll enjoy it while it doesn't hurt, or make me have to pee. am giving my daughter to remember this pregnancy by.